This plate seems to be especially perfect for people that enjoy creating little stories on their nails, or that like skittlette manis, because you really can go nuts with all these images! Although I can appreciate a story or skittlette on someone else's nails, I usually prefer all my nails to be the same, or maybe just an accentnail here and there. (I can get a bit restless and it can feel unnatural if they ain't the same/similar and then I just want to take it all off, I suspect it's my autism that's involved there as well, but I'm slowly getting into more variation :)) Having said that, I can totally see what you could do with this plate! You could obviously start your story with the text on the top left, and use that image next to it with a path leading to a castle, and then fill the rest of your story with dragons and knights, or go for the princess route, with the top right swirly image? And I see plenty images to create a Cinderella story! You could also make a knight's armor look with the full nail image on the right, or go for a royal look with crowns, maybe in deep, matte red with shiny gold. The full nail wings on the bottom left can also be used as fire, or just as a random stripey design. 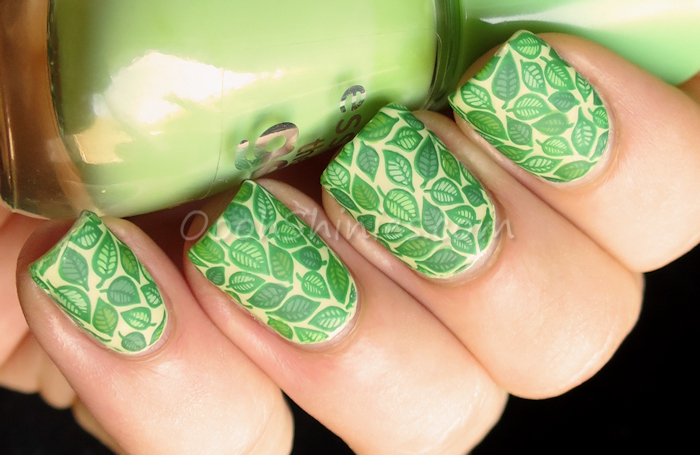 For this mani I stamped the leaves design in green on my Uber Mat, and colored them in with 4 different greens. I then applied a thin coat of the basecolor over the decals, let them dry, and applied a coat of basecolor to my nails to which I applied the decals. If you apply a decal, there's a chance that you get airbubbles underneath, and if you stick with just the clear top coat on the decal, they'll be visible through that top coat. I might have airbubbles under this mani, but because of that layer of color, they ain't visible. I think it's much more relaxed to apply the decals like that! 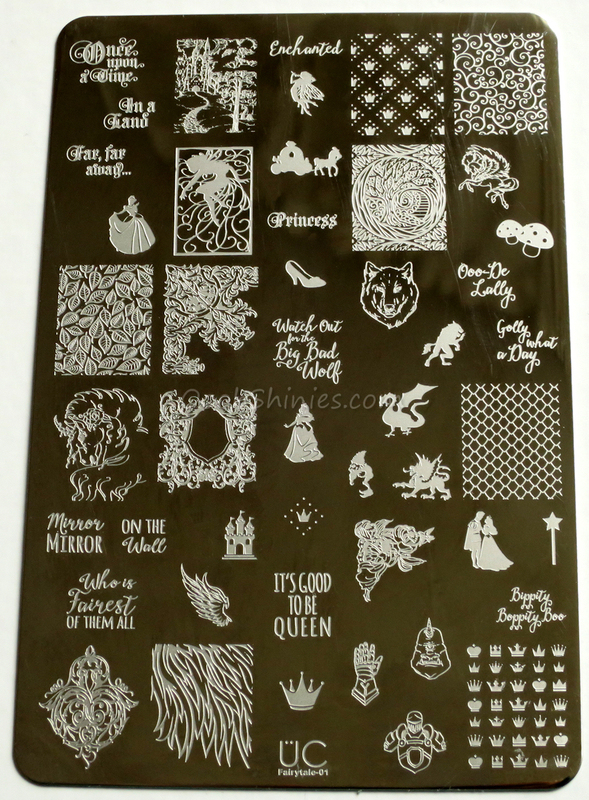 I do notice that these decals can get a bit wobbly from all the polish, and need a few layers of top coat to give a smooth result - or just a layer of matte top coat. That way it'll look smooth without much coats ánd the design will often stand out more as well! 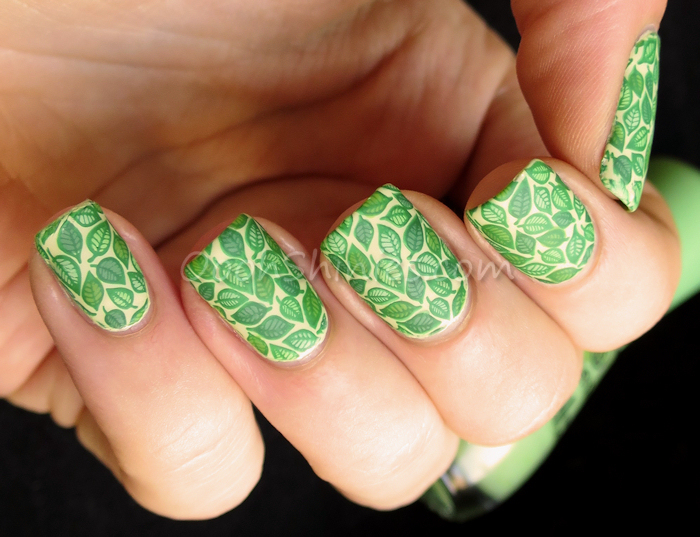 Essence Exits On Your Right with Konad Green, Essence Brazil Jungle, Catrice Run Forest Run!, China Glaze Gaga For Green and W.I.C. By Herôme Malmö, UberChic Beauty plate UC Fairytale-01 and Dance Legend Top Satin. Do you like stories on your nails? And what do you think of this plate? 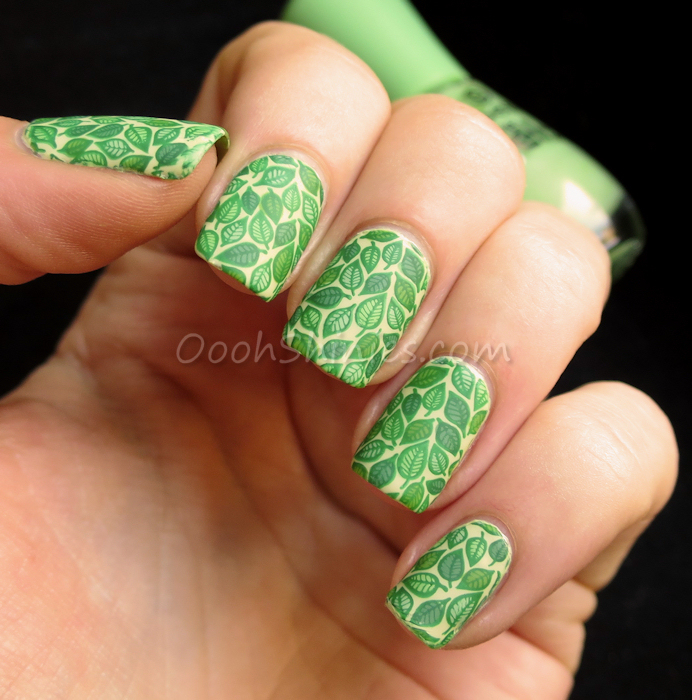 Let me know what you think, and do feel free to share your manis in the comments (links are automatically marked as spam, but you can upload an image there)! :) Thanks for looking and have a wonderful weekend!